One of the major questions surrounding climate change is What are we going to do about it? Unfortunately, that is a very difficult question to answer. The range of possible solutions is so wide that it is close to impossible to find one solution that would work the best. Chances are, as you sit there reading this post, you can think of at least one possible solution being discussed by scientists and in the media. Things like renewable energy, low meat diets, and decreasing your carbon footprint are commonly heard of in the news. Less heard of, at least in connection to climate change, is building safer infrastructure and flood protection or growing crops that thrive in warmer, drier climates. However, these are all important aspects of the climate change discussion. What makes these solutions different? When considering possible climate solutions, there are two main courses of action that could be taken: mitigation and adaptation. 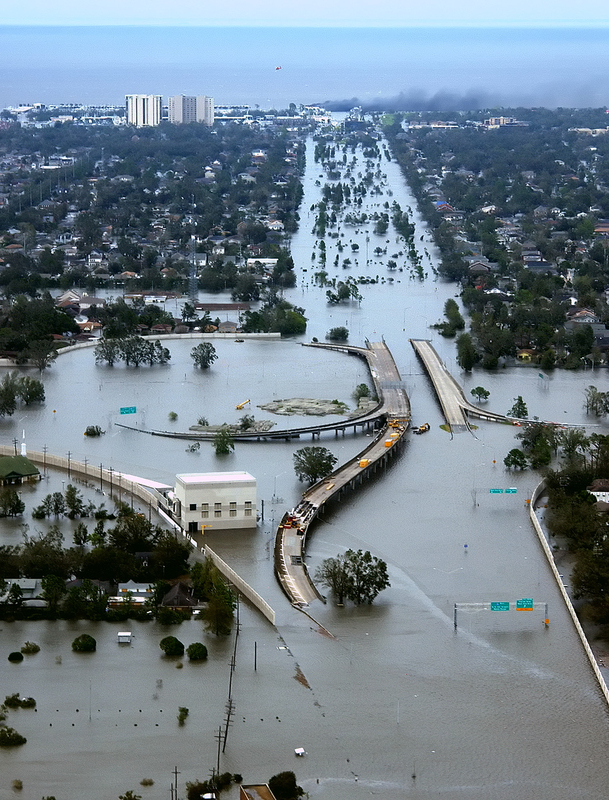 The first, more often talked about solutions I mentioned, are examples of mitigation. They seek to reduce carbon emissions to prevent the furthering of climate change. The next group of solutions are examples of adaptation. They seek to prepare individuals or societies for the effects of climate change. Mitigation considers all things carbon. Many of the policies and efforts centered around mitigation are based in the science of the carbon cycle and how carbon is moving through our environment. 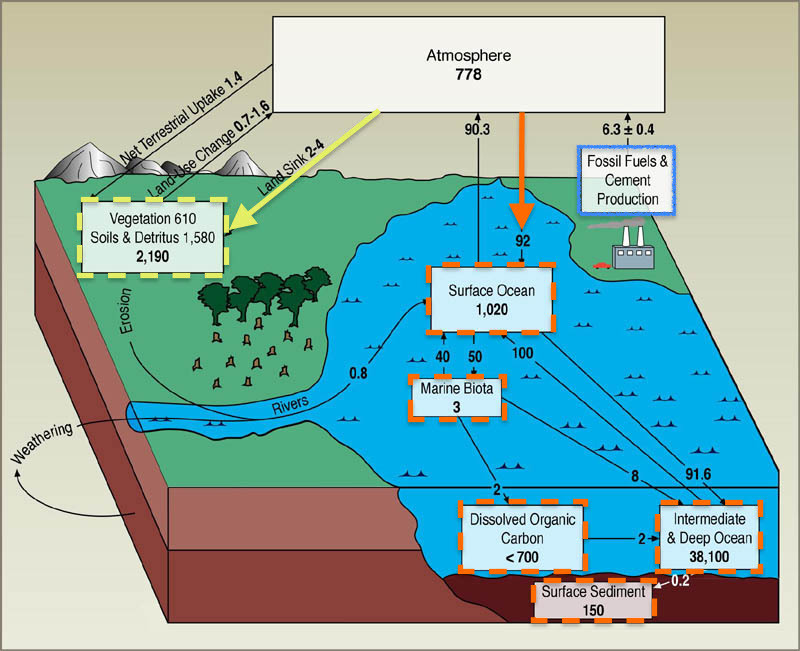 This is a diagram of the carbon cycle. Since climate change is exacerbated by CO2 concentration in the atmosphere, there are two possible courses for mitigation: preventing CO2 from entering the atmosphere, and increasing the amount of CO2 taken out of the atmosphere. These courses of action follow the path of the carbon cycle. There are a few important things to note on this diagram. The dotted lines show possible areas from which carbon is removed from the atmosphere, also called carbon sinks. Yellow represents a land sink, while orange represents an ocean sink. While many times projects to enhance sink-related mitigation are very costly and hard to implement, improving the ability of these ecosystems to remove CO2 from the atmosphere is an effective method utilizing nature to assist in the process. Unfortunately, many of these ecosystems are being compromised by climate change, limiting their use as a carbon sink. The other more common type of mitigation is limiting the CO2 entering the atmosphere, often through emission restrictions or use of renewable energy. Many climate change policies implement this type of mitigation solution. Adaptation is the way to prepare for what is coming. Many policies based around adaptation work with a physical plan to defend against each individual impact of climate change. Houston’s response to Hurricane Harvey is a great example of a city not being prepared for what came their way. Adaptation seeks to provide the best chance of surviving climate change impacts. Entwined with adaptation is environmental justice. Those who require to adapt the quickest are not necessarily even high conbributors to carbon emissions. Still wondering about the difference between the two? Check out what NASA has to say!